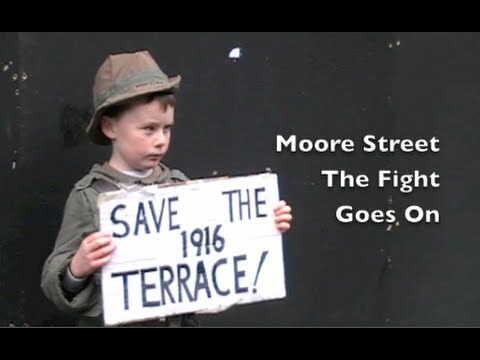 #SaveMooreStreetfromDemolition This is an important call to you to take part in this crucial show of support of the 1916 Moore Street Markets Battlefield site, on this Saturday. We are asking people to come in 1916 uniform or clothes, to bear one of the flags of the 1916 Easter Rising, to tell and bring your friends and comrades. #SaveMooreStreet Please share this post. 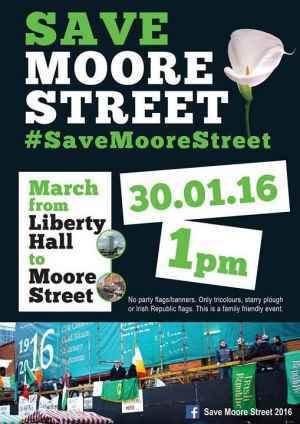 The march assembles at Liberty Hall at 1pm on Sat 30th and then proceeds to Moore Street. We urge as many people as possible to attend to event because this probably the last chance we have not to turn this into another Wood Quay episode where our history was destroyed and concreted over. 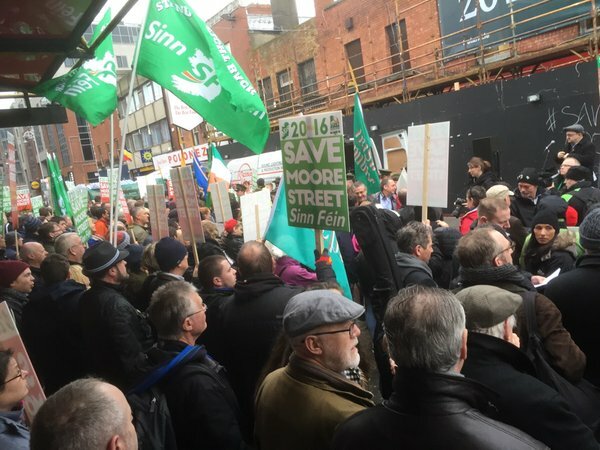 A huge shopping centre is planned for the Moore Street site by developers -the same kind of people who helped wreck the country and put their own greed and profit first and they are being facilitated by the FG government who for once and for all want to bury any memory of the rebels and their revolutionary ideas. Indeed it this era of consumerism and corporate control and the impending TTIP agreement between the EU and US that has central to it something called Investor State Dispute Settlement (ISDS) which are special courts presided over by corporate lawyers, for use by corporations and are ABOVE our national sovereign and there is no right to appeal and are in secret. They will allow corporations to sue the state for non-competitive activities, such as labour laws, environmental protection, safety and will be able to force the privatisation of everything from health, education, prisons, water, forests and any other public entities. -It is to stop such monstrosities as this that we need revolutionary spirit and ideas and you can be absolutely sure that the rebel leaders of 1916 are turning in their grave that the hard won sovereignty for which they gave their lives is about to be given away in this TTIP treaty. Indeed no less than leading members of FG have actively promoted and encouraged that Ireland have these ISDS courts. This is amounts to treason. 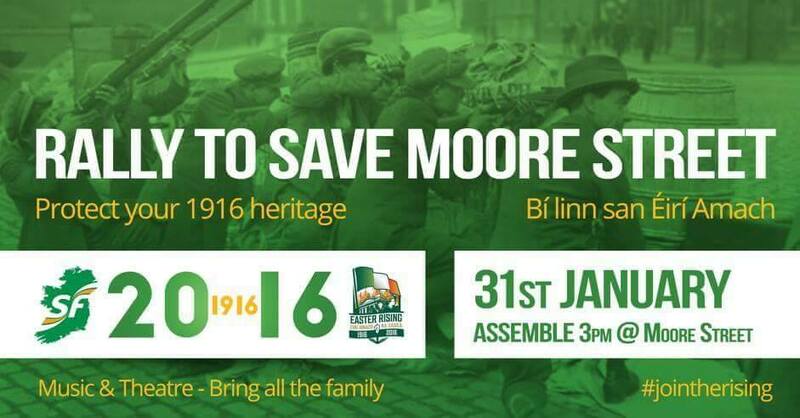 So please show your support for the Moore Street campaign and lets start first by preserving our heritage. 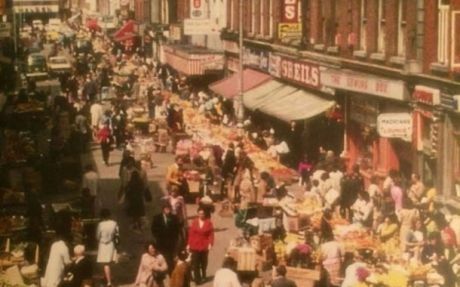 We include an recent article by Maureen O'Suvillvan TD on the saga of Moore Street and which includes a timeline of events so far. Since 2009, when it was first acknowledged that this historically significant area could in fact be destroyed and built over as Wood Quay was and Kilmainham Gaol very nearly had been in the 1950s, we have fought to make sure we don’t lose Moore St but for a fitting historical quarter to be put in it’s place preserving the buildings and the street. 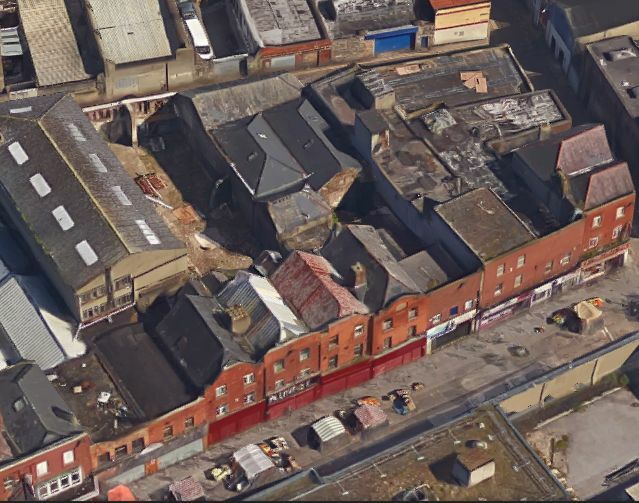 Eventually the struggle resulted in the Government purchasing 14-17 Moore Street as a National Monument which is a tiny portion of the full historic terrace. In recent weeks this issue escalated when word was received that buildings either side of the 1916 Monument were being demolished. 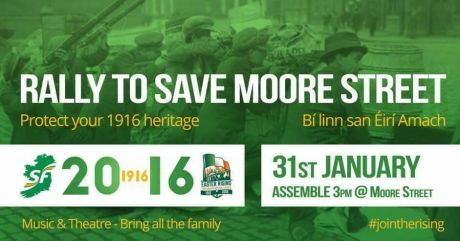 Dec 16th 2015: Government coalition vote against saving Moore St from total demolition by outnumbering opposition TD’s in the 1916 Quarter Development Bill 2015. Jan 5th 2016: Construction workers recommenced work, erecting scaffolding and hoarding. A commencement notice had been granted for surveying building features in the National Monument but the works seem to be far more extensive. 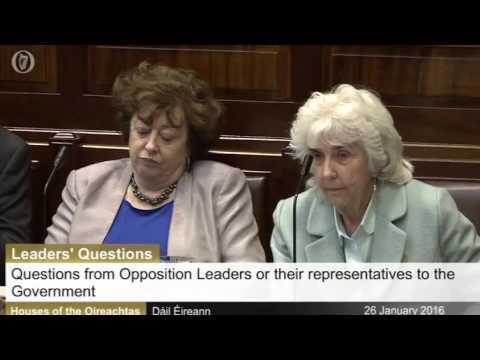 Jan 7th 2016: Moore St. Dáil Group raise the issue in the Dáil with the Minister once again; Minister doesn’t back down. That evening I get word that building fronts are being removed and the interiors are being left open to elements. Seemingly a plan to demolish buildings either side of the National Monument is being put into action. Jan 8th 2016: A protest takes place on Moore St and the groups in support of Save Moore Street occupied the buildings to prevent demolition of a number of buildings as there was no other choice. 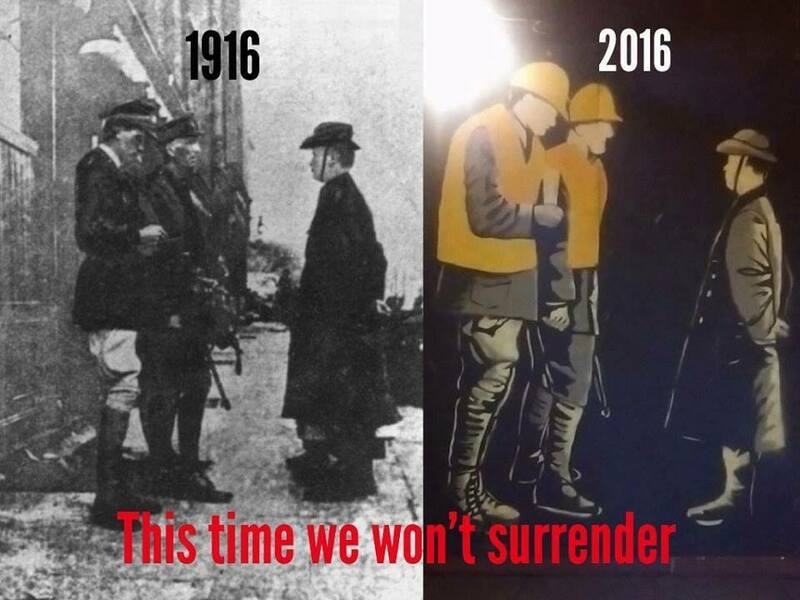 Jan 11th 2016: The High Court puts a temporary stop to demolition on Moore St until a full hearing of the case taken by the 1916 relatives on the 2nd of Feb.
Jan 12th 2016: The groups overwhelmingly agreed by a show of hands to vacate the site after a meeting of the groups in the Moore Street Terrace, as the immediate threat of demolition was averted. Jan 15th 2016: After a number of protesters who occupied the buildings raised the damage they had witnessed inside the buildings a group of TD’s and the Lord Mayor sought access to the site with independent conservation experts to inspect the work that was carried out and to see if any structural damage had taken place along the terrace. After initially being told we would be allowed access, every 5 minutes we were told it would be another 5 minutes. Eventually the two conservation experts were refused entry by the foreman and no reason was given. Jan 20th 2016: After sending a formal request to the Minister for access and following up with calls on Monday and Tuesday I eventually received a response from the Minister with no indication that a visit would be granted, instead she says she has arranged for an inspection by “a senior official of the City Council’s Planning Department, accompanied by the City Archaelogist, who can afterwards provide you directly with the information you have sought about the current status of the works.” We’ll see what becomes of that review; City officials are to report on work to the National Monument at a Lord Mayor Forum at 2pm tomorrow (26th January) at City Hall. I will be making an application through the Chief State Solicitor’s Office for access and on February 2nd we will find out the High Courts’ decision whether the works on the buildings are allowed to continue or not. We sincerely hope that the High Court decision will reflect the huge outcry of support the campaign has received and that a new vision for the entire area will be realised. The irony of what the men and women in 1916 fought for and what is going on now, these men and women fought not only for Irish independence but for an Ireland of Equals and they would be dismayed that the ordinary people have to campaign and fight against a Government and council that puts corporate interests ahead of the will of the people. We live in hope that the decision will go our way but if it doesn’t the fight will continue as this is too important to let go. We will not let 1916 Dublin be built over in the same way Viking Dublin was with the Civic Offices in Wood Quay. Great photo included of Moore St in 1974 long before is was allowed fall into it’s current state. This exchange took place in the Dail earlier this week. During Leaders’ Questions on Tues 26th Jan 2016, Independent TD Maureen O’Sullivan raised the recent protests at Moore Street. Ms O’Sullivan specifically asked Taoiseach Enda Kenny why the Government isn’t doing more to protect the entire Moore Street terrace and not just the buildings numbered 14-17. “In respect of the centenary commemorations for 2016, Government decided to purchase this for a sum of €4million and to restore this building in a proper, authentic and time of the period fashion. As I understand it the maps show clearly other documents, buildings on either side were either non-existent or in a state of collapse before the Rising took place in 1916. And you are right, this was the centre of the end of the evacuation process from the side door of the GPO…but you know Deputy O’Sullivan what the Government wants to do for the people here and for posterity is to take the buildings where the surrender was commissioned from and preserve that as a national monument in respect of one of the first small countries to achieve its, to strike out for independence, politically and economically at the start of the 20th century. WHY was moore street was allowed to get into such dis-repair,where were the AAA,PBP and Sinn Fein et al before all this? Where urban 'redevelopment' is concerned Big Money calls the shots. Government and the financial industry don't give a toss about heritage and the Moore Street traders. In the untarnished 1916 surrender photo we see the feet of Nurse Elizabeth O'Farrel next to the boots of Commandant Pearse at the official surrender. In the non-Banksy mural of 2016 we don't see the gallant nurse's feet. Whatever the aesthetics, the history is offside. Good report on the UTV site. Sinn Féin deputy leader Mary Lou McDonald addressed another huge turnout on Sunday in the second of two protests held over the weekend over plans to demolish buildings on Moore St in Dublin. ...Speaking during a rally on Moore St on Sunday to save the site from demolition, Sinn Féin's Mary Lou McDonald criticised the Government over the plans. ...“The Government should be ashamed that citizens, the relatives of our 1916 heroes, were forced to go to court to halt this work in just the second week of this the centenary year. This should not be their burden to bear." she said. "The safeguarding of our culture and heritage is in the hands of Government and it is time they acted like it," the Dublin Central TD added. 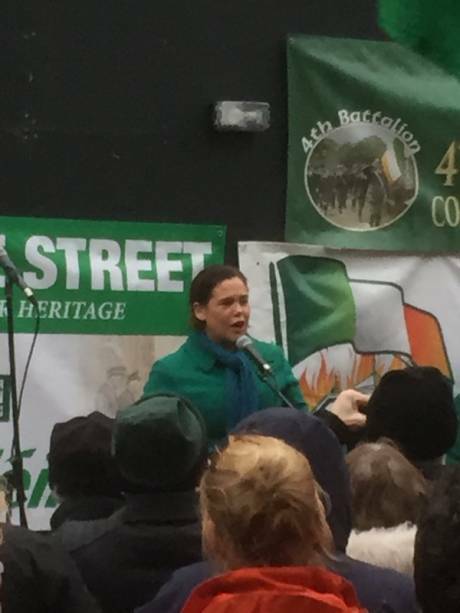 “It is an affront to the legacy of the men and women of 1916; the men and women of this proud island who took on an empire in not just this fair city, but in Wexford, Galway, Meath, and Louth," she continued. Deputy McDonald told the crowd that Moore St was "an election issue" and said the government "must understand it will not get away with bulldozing or damaging the terrace." The Save Moore Street campaign was angered by a decision to have Minister Heather Humphreys lay the wreath. 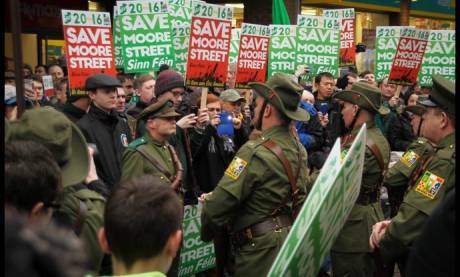 ...Protesters heckled Minister Heather Humphreys as she attended a 1916 commemoration on Moore Street this afternoon. The recent High Court victory declared the entire street a ‘battlefield site’ undermining the claim by the government that only buildings 14-17 Moore Street were of significance.